The Koriba series is set in Africa deep in the mesolithic (the middle stone age) among a tribe of modern humans. It is a time of immense cultural and technological change – with language flourishing, art developing, new weapons to hand and new ways of seeing the world. One tribe in particular has created a powerful new tool – storytelling. It is the gift the Koriba will bring to the world – if they survive. 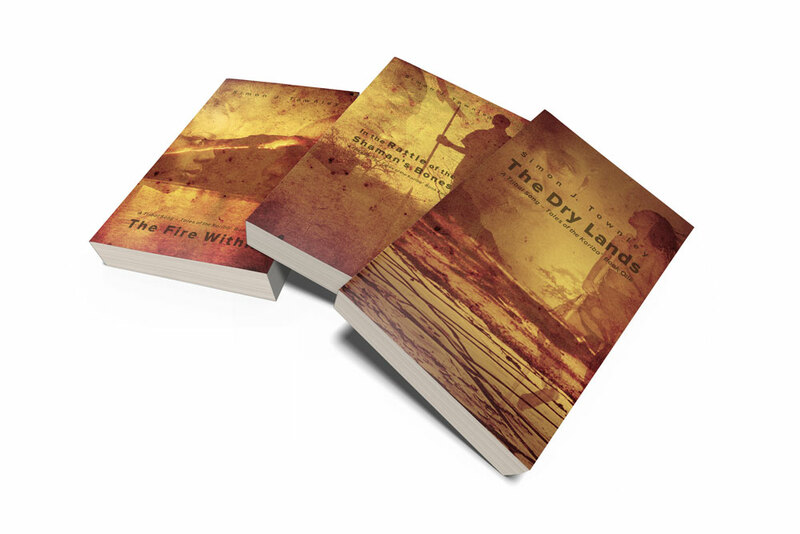 The Dry Lands – isolated by a changing climate, a prehistoric tribe searches for a way across the desert that surrounds their homeland. Temfe, the son of the chief, sets out on a journey that will change his life forever. In the Rattle of the Shaman’s Bones – to save the Koriba, Temfe must learn the ways of the shaman, walk the vision-worlds, defend the ancestors and defeat a murderer who wields malign power. The Fire Within – in the heart of Africa, 43,000 years BCE, the Koriba begin their long trek north. But many enemies await along the banks of the great river. Ancient Quarrel – the love of Arom and Lajula is forbidden by the rules of her tribe. Duty holds her back. Loyalty to the Koriba calls him away. A timeless love story set in the stone age.